The day we were supposed to go to Sapi Island it rained in Kota Kinabalu, Malaysia. I love beaches (after mountains) and I was disappointed. 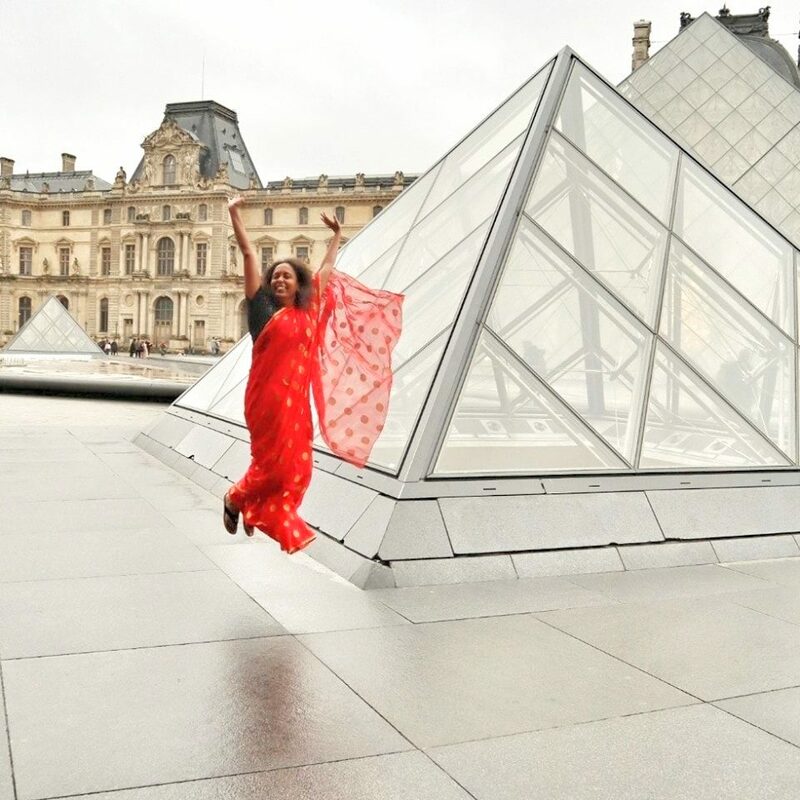 However, the visit to the Mari Mari Cultural Village which we did in lieu turned out to be wonderful! Our guide John Prudente called the Coral Flyer Zipline in the afternoon to see if the zipline was open but we had no luck. 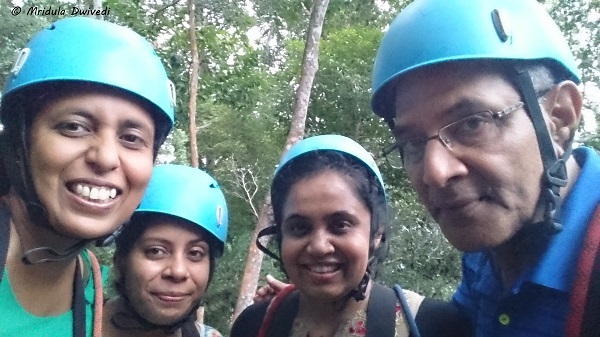 So, whether the island to island zipline happened or not was in the hand of rain gods! The next day I woke up to some clouds and rain. We got a message from John that the zipline was open and we were going to Sapi Island. He collected us from Hyatt Regency Kota Kinabalu where we were staying for two nights. The third night we stayed at Le Meridian, Kota Kinabalu. 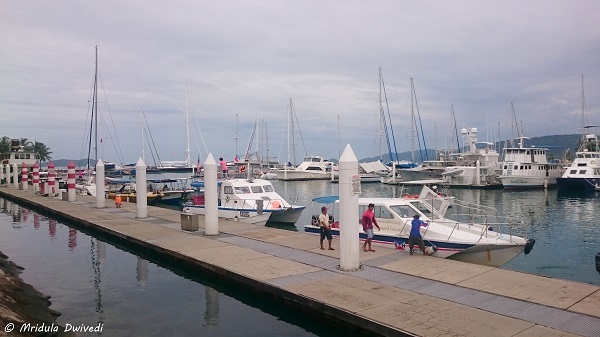 We went to Sutera Harbor to take a speed boat to the Sapi Island. We walked around the harbor till it was time to board the speedboat. The sea was a bit choppy. The speedboat was landing with a small thuds on the waves. Suddenly John who was sitting at the front of the boat was lying on the floor in pain. He hurt his back on one of the landings. We were all worried and concerned. The boat dropped speed. John was able to walk once we reached Sapi, but we could see he was in pain. He took a painkiller and sat in a corner. He told us to go ahead on the zipline, he would wait for us. We walked around Sapi Beach. It was crowded. Due to the bad weather the ferry service was suspended the day before, so the tourists were out in number. Soon it was our turn to head to the zipline. A speedboat took us to the nearby Gaya Island. 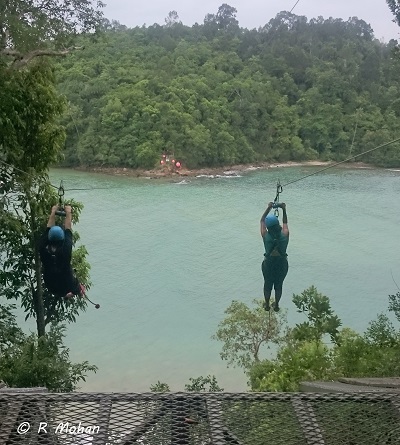 The zipline is between Pulau Gaya Island and Pulau Sapi. It is 250 meter long. It is the longest island to island zipline in the world. Pulau means island in Malay. Once we landed at Gaya Island we could see the signs to follow for the zipline. It involves climbing uphill for a short distance. There is a harness station mid way. The staff put a harness over me and handed me the pulley. Then the staff at the main platform did further checks before letting me loose on the line! As it is a double line, two people can go in tandem. A group of five people were going before us. One girl was almost in tears before the start but she did fine! Soon it was our turn. Taking pictures is always tricky on ziplines. Luckily one member of our team, the most senior too, had a deep pocket where he kept my cell phone after clicking my picture! That is how I managed to have one picture of mine on the zipline. One boy in the group ahead did the zipline holding his GoPro in one hand. And to his credit he did not drop it. The ride happens on tremendous speed, it gets over in less than a minute. The view from the line is spectacular. At the end of the line are brakes for slowing the speed. Except them and you would be fine! 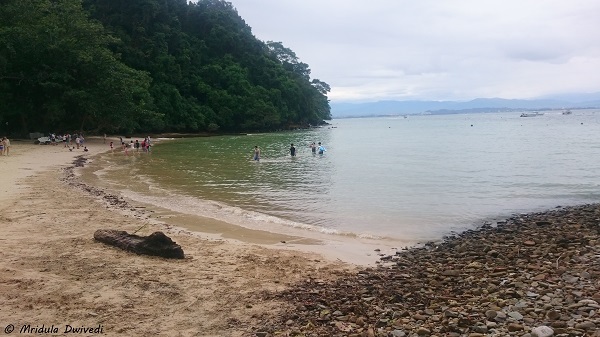 We walked back from the landing point to the Sapi Beach again, all in high spirits. Though we were anxious about John. When we saw him, he was still in pain. The weather was turning bad. After a while the zipline was stopped again due to the rains. I saw the instructors zipping back in the rain to Sapi. The sea looked entirely different by now. We were wondering how we would go back. But the folks at the island organized a speedboat for us with John so that he could lie down while going back. He was talking to the organizers in his own language but I could guess John was asking to arrange raincoats for us. I told him none of us needed raincoats! We started back with the boat going with extreme caution. We could not see the shore in any direction. It was quite unnerving. However, we got to see the building around the Sutera harbor after a while. We were in safe waters. John messaged later that he has been ordered bed rest for 3 months. His back was injured. I felt so bad. I wish him a speedy recovery. Even when he must have been in so much pain he was worried about raincoats for us! 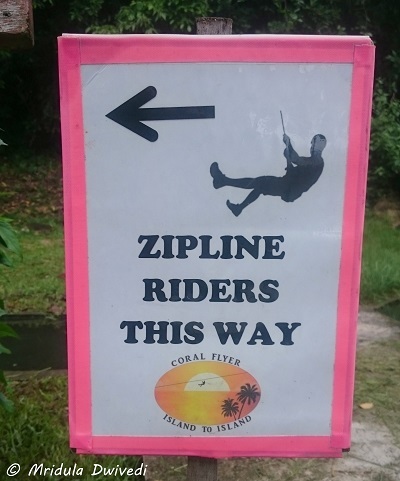 If you plan to go on the island to island zipline make sure that it is open that day. The Coral Flyer is a lot of fun but it is weather dependent. PS. I was on this trip to Kota Kinabalu in Sabah, Malaysia with Silk Air.